We have been pre-approved for up to $350,000! Be that as it may, we have advised our real estate agent to look only in the $300K or under range and up to $330K IF the place has a suited basement with as separate entrance for rental income. There are four properties just under $300 that Jordan and I found and were interested in. He's going to set up viewings for them on Wednesday as well as any others he can find. Jordan and I figure that we only have until the middle of March to find something, otherwise we'll have to switch gears and look for somewhere else to rent if we want to give notice in April/March to be settled by June. I have discovered my new favorite website! While brainstorming the best way to develop our wedding invitations, I came across a website that lets you design your own and then pay to receive a high resolution pdf and .jpeg version - so that you can get them printed anywhere (or at home as the website promotes). It's called Purple Trail and I highly recommend it! I've found that it's really adding a personal touch to planning our wedding and it's a huge cost saver. Even if we were to purchase invitation kits at Michael's for example, it would have cost us upwards of $250 plus printer ink, plus a bunch of waste because we don't need everything that comes in the kit. Using Purple Trail I designed our wedding invitation, an information insert and an RSVP card all for $13.95. The company I work for has a printing company in the same building. I spoke with the owner and he can print all of my invitations that I need for about $70 - for a grand total that's under $100!! He printed the proofs for me yesterday and i'm going to show them to my mom this weekend to do a final spell/grammar check! Our mortgage broker sent us a couple of different finance options via e-mail and it was pretty hard to follow, so I dumped everything into an excel spreadsheet so I could understand it and share it with you. 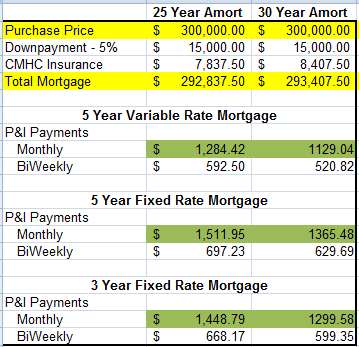 She sent us the breakdown of monthly/bi-weekly payments based on both 25 year and 30 year amortizations as well as how the payments would look if we were on a five year fixed rate, five year variable rate, or three year fixed rate (she didn't include the rates b/c they are subject to change at this point). Once we tell her which way we would like to go, she'll do a rate hold for us. I showed this to Jordan this morning, which granted was pretty early in the morning - but he is more comfortable with a fixed rate, because then we always know what the payment will be. I'm including to go with a five year term, because interest rates are only going to go up from where they are. I'm not a big fan of the 30 year amortization because the CMHC insurance is more; that said - the payments are of course lower (yes I know we would pay more interest in the long term). And while I've been talking about monthly payments, Jordan and I would structure bi-weekly or weekly payments like everything else - but talking in monthly terms is just easier for the time being. We would really love the opinions of anyone who has ever bought a home....what decision did you make - and do you have any tips/regrets? I think I've remembered everything from other posts I've done, but feel free to comment on this mock-up as well....have i forgotten anything? At $1,500 mortgage there is not a lot of wiggle room - there's also no room to save for things like fun holidays. It potentially could also put us in a pinch if I got pregnant in the next year or two. After a lot of deliberation, Jordan and I have decided not to wait for home ownership by waiting for my aunt to be ready to sell us her home. It’s been a year and a half now, and she’s still not 100% sure. So, instead of continuing – we’re going to get pre-approved and start house hunting! Hopefully in a couple of years, we can still by her home as an investment property, but for now we want to find a home that we can begin our married life in and have kids in. We want a home that Aries can have a big back yard to play in too! We’ve submitted the majority of the documents we need to our motgage broker and now just need Jordan’s confirmation of employment letter. The approval is good for four months, so if we don’t find our perfect home in that amount of time – we’ll move to somewhere dog-friendly and just rent for another year while we continue to save. Hopefully, we can find a home though. While one of our roommates is moving out this month, the other is with us until at least the end of the school year. Jordan and I have decided that if we find a home to move into, we'll offer to move him with us and keep his rent agreement the same. That way, our life changes don't upset him in his grade 12 year (that would just me mean I think). I transfered $1,500 from our house fund into our new joint Thrive account in case some of the auto-payments go through before our pay cheques go through. I also left $500 in the old account for the same reason. Hopefully, by the end of next month - we can close things off with CIBC. I'm pretty sure we caught everything - it would be horrible to have forgotten and have a missed or bounced payment. I'm especially pleased that the landlord is willing to accept e-mail money transfers, as with Thrive we only get 20 free cheques (and I need them to pay my horse board). Have you switched banks recently? Do you think I forgot anything? I feel like I've been going at 160kph for the last few weeks! Since Christmas we've kicked wedding planning into high gear and while we set out to spend little to nothing this month, we adopted a dog and realized that when you're not eating out - you spend a lot more on groceries! I still think that we're in pretty good shape, but we did spend more then we intended to. We went out a couple of times with friends and some of Jordan's family came into town as well - so there was a tad bit of eating out. I'm using an online program to design the invitations/insert cards/RSVP's - which I thought I was done until I showed a draft to a couple of people. I got some great ideas, but had to go back to the drawing board in some sense. I think they are really coming together now and am excited to get them to the printer's next month (why next month? because I'm really trying to spend nothing else this month). I think when I lag in writing here, I lag in keeping track of our spending - need to nip that in the bud! Another change that is coming up is switching from CIBC to ING Thrive chequing. We're so tired of bank fee's and this move with save us about $467/year. It's going to be a huge pain to make all the changes, but worth it in the end. I'm going to transfer a couple thousand from our house fund into the new chequing to as a placeholder in case everything doesn't line up. I'll then move the money back once we know all the automatic withdrawal's are coming from the correct account. We'll also have to leave $1,000 in the old account for the same reason. Is anyone else switching to Thrive? Okay - I think that's the update for now. I'm looking forward to getting back into the swing of things and am going to try to slow down a bit (like that's going to happen, ha!). Last weekend my best friend A and I went, what we thought, we be a trial wedding shopping event. I wasn’t looking forward to it (I really don’t like shopping for clothes) and thought it would be similar to shopping for a bathing suit (really, who likes that?!). The plan was to come back at a later date with my mom and my other brides maid to make the final decision about what looked best. We met at the first bridal store and were met by very positive people. I filled out a basic survey that asked questions about when the wedding was and what I was looking for. We then met with my consultant she asked, and I told her that I had no idea what I was looking for. On that note, she suggested that A and I go pick three dresses and she’ll go pick three and we’ll just start playing with different styles until we find the perfect one. The second dress I tried on was it! It fit perfectly, like it was custom made for my body! To be safe, we continued trying on dresses – I think I wound up trying ten different styles on. I hadn’t intended on buying anything as my grandma had offered to make my dress – we really were just playing – trying to see what would look good. After the tenth or so dress, the consultant suggested that I put my first love back on. She took me to the big pedestal in front of the window which had the light shining in and the dress just sparkled! A cried a little, which made me tear up a little. We talked a bit and thought (which was later confirmed) that my grandma wouldn’t have been able to make this dress – it was far too intricate (she’s a quilter and has made 3 other wedding dresses). After a few tense moments and a realization that I didn’t want anyone else to have this dress, and I decided to buy it! My original budget was $500 because I had NO CLUE what a dress would cost – but figured that materials to make it would cost about that if my grandma made the dress. The dress I chose was regularly $1,250, but because it was a sample dress (even though no one else had tried it on before as it had come in that morning) she offered 10% off. At the till, I asked her if we could get it under $1,000 and so we got it down to $990 plus gst. 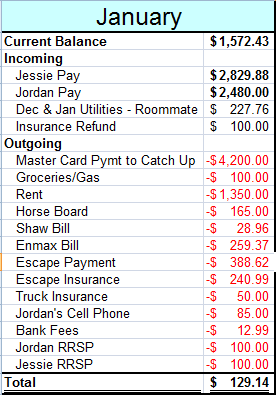 So, I spent $1,039.50…. double the original budget. Whoops! As you know, Jordan and I have been trying our best to get back on track this month and not spend more than we 'need' to. There's always room for improvements, but I think we're doing pretty well. As we made the decision to eliminate our allowances (just for the month) I'm struggling a bit when friends ask to go out to do something. I'm wondering though, what fun things do you do with your friends when your watching your pennies. It's winter, so it's a lot harder I'm finding to come up with interesting things. I (and i'm sure she) would love to hear your feedback on this one! Jordan and I have wanted a dog for a very long time, we have finally found the right one for us. One of my cousins friends was going to take her to the pound, and we didn't want to see her put down - so we took her instead. We met her when she was just a pup this past summer, and at only 8 months old - she's already so big! 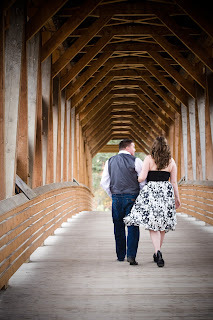 Out of the 91 engagement photo's that were taken, we had to choose our favorite 10! I was able to get it down to 30 fairly easily but I didn't think I could get it down any further. I got in touch with our photographer and told her just that, and she gave Jordan and I one of our best Christmas presents. We still had to choose our favorite ten photo's, but she's giving them all to us after the wedding. The value of those photo's is $970.20. I'm pleased to share that today we received our top ten! I'm so excited to start printing and sharing these that I thought I would share a couple with you! I recently went through my blog list and found that quite a few that I used to follow have dropped off or decided to 'take a break' from blogging. My favorite blogs are typically those that are personal finance blogs - that aren't 100% 'how to' or 'ten steps to becoming debt free' style. I like reading about real people and their real experiences with money management. If you have discovered a new PF blog that you just love, would you comment to this post with the URL? I'd like to have a bigger reading list and thought I would reach out to you - my readers. If you are reading my blog, I'll probably like the other's that you read. Below is a graph of our utility expenses for the 2010 year. I thought it might be interesting to share this and to see if anyone else does a similar blog post. 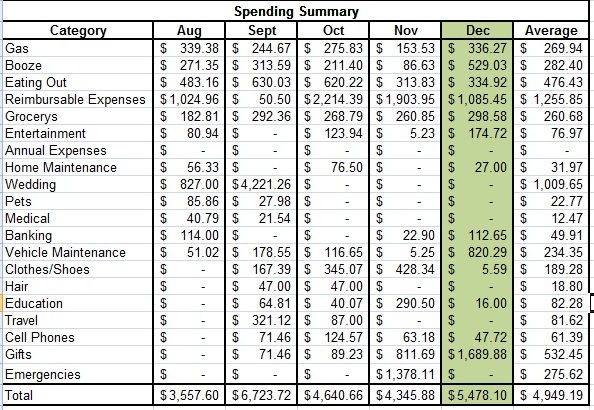 Our average monthly bill decreased from $267.45 (2009) to $252.73 (2010), which is stellar. Hopefully next year we can see a similar if not better decrease. I should mention that we're heating a three bedroom, 2.5 bathroom townhouse - so it's a decent sized home. Not as big as a big house, but not as small as a condo. It looks like May had a huge spike, but May/June had a billing error. The actually usage is the average of those two numbers. Apparently, that sort of thing happens fairly often as they had a process in place to deal with it. What do you pay a month for your utility bills? 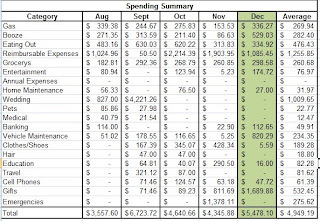 It's time to share our Monthly Spending Summary again. The month over month image is a bit small, but if you click on it you can view it in detail. I've highlighted in green December, which is the month we're currently looking at, as well as added an average column. We spent more on gas then we did in November, but about the same as in August - which makes sense. They are both months when we drive more than normal. I'm actually surprised we didn't spend more because of our new vehicle. We spent a TONNE on booze. Please keep in mind we haven't actually drank all of this. I tend to re-stock our bar in December b/c we often have guests stopping by. There were also a few gifts of booze that I didn't separate out of our personal consumption. As well, we had a huge New Years Eve Party...so I'll just leave it at that. Eating out was on par with November, which is great b/c we were on the road a lot. I expect this will go down significantly (if not $0 for January). We spent a little more on groceries, but not a lot - this is pretty average. Entertainment is high because of some decoration purchases for the New Years Eve Party. Banking just depresses me, for the first time in probably two years we have to pay interest. We weren't able to pay off last months bill 100% before the deadline. This is the second month I've been tripped up with the deadline not aligning with the last pay day in the month. With our $100 diet challenge this month, we should be back on track for January. If you remember back to my winter tire post (it got little action, so I won't be offended if you didn't read it), we bought new winter tires for the Escape - so this is high because of that. Gifts is just gifts....some of these were purchases for other people that we got reimbursed for but it was at stores where many things were bought, I don't have the receipts on me so didn't sort it all out. 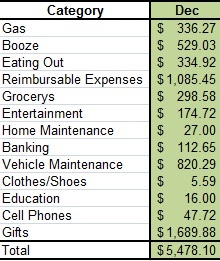 In total, we spent $5,6478.10 in the month of December - of that probably around $2,500 was reimbursed. Jordan and I are looking forward to a quieter month with a lot less spending. I'm actually looking forward to writing this post next month (I think it will be a lot shorter). 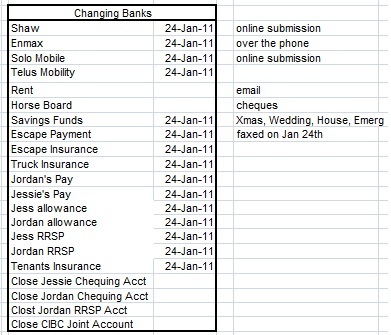 While it's hard to acknowledge where the money goes I am still finding this a valuable exercise - to put all the details on paper (or excel) and share it with both you and Jordan. I think it keeps us honest and helps remind us where we want our cash to go. Check it out! I've started a new page. One of my goals for 2011 is to keep track of all of the great (and even not so great) books that I read every year. I'll include a few coments and links to the author's website in case you're interested in checking it out. Like so many others, Jordan and I overspent over the holidays. We had an amazing Christmas and New Years and don't regret a dime that was spent. That said, we do need to get back on track. With this month being our roommates last, things are even tighter then they would have been (as we don't have his $500). So, we've issued ourselves a challenge. We need to spend no more than $100 on ALL VARIABLE EXPENSES for the month. That includes groceries and gas....which is probably all we will spend it on - there's no room for entertainment here. I imagine we'll be getting a lot of use out of our world of warcraft subscriptions (and my ancestry.ca subscription). you may notice that there is about $130 that we're carrying over into next month - this is needed next month to cover an anticipated, one time, increased phone bill. Are any of you living on tighter budgets this month to play a bit of catch up? I'd love to say that this was just because we didn't plan well, but we had two huge family emergencies this past year that depleted our Christmas and Emergency funds both times. 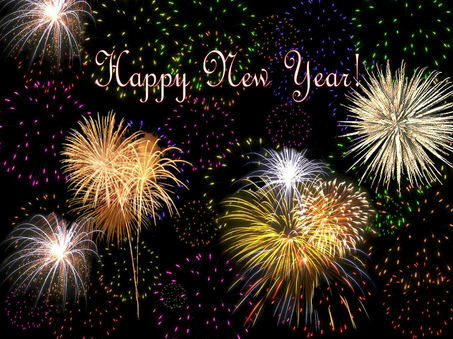 I'm looking forward to an emergency-free 2011. I happily pilfered this image from this website.